Girls’ education lags behind boys in many countries, particularly in the fields of math and science. Improving girls’ numeracy skills could give them the opportunity to pursue advanced education in these fields and improve their employment prospects. Can adding supplementary math teachers and sessions to classrooms improve girls’ numeracy skills and professional aspirations? Girls’ education lags behinds boys’ across Sub-Saharan Africa, with only 21 percent of girls completing secondary school (compared to 28 percent of boys)1 and 66 percent able to read and write (compared to 76 percent of boys).2 Better numeracy skills could give girls the opportunity to pursue higher education in traditionally male-dominated fields such as science and engineering, and thereby improve their employment prospects. However, teachers are often insufficiently trained and overburdened with work. In such contexts, adding temporary supplemental teachers trained to teach math could improve learning outcomes and employment prospects. Can supplementary math teachers improve numeracy skills and professional aspirations among girls? In Benin, 42 percent of secondary-school aged youth are enrolled in school and girls are one-third less likely to be enrolled than boys. For those who do attend school, quality of instruction is often low. 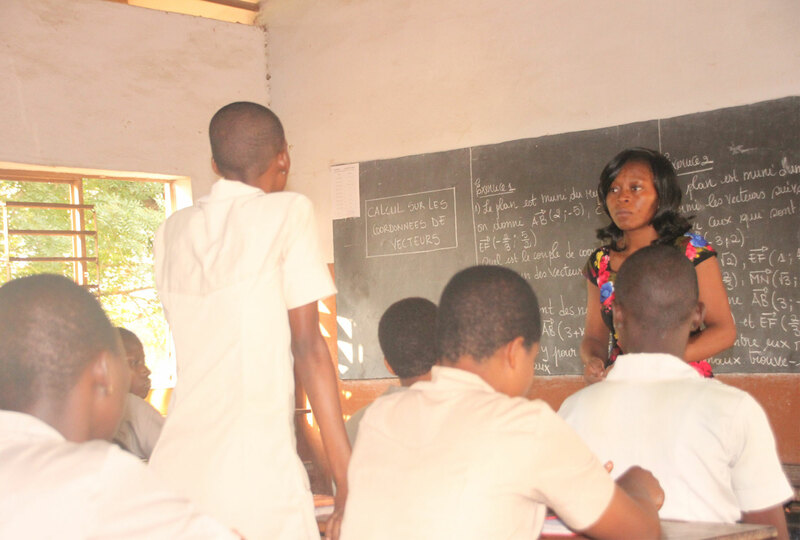 Despite the importance of quantitative skills in the 21st century, Beninese students’ enrollment in math and science courses has declined since the 1980s and, in some schools, the math and science track has been cancelled completely. In partnership with the Institute for Empirical Research in Political Economy (IERPE), the National Institute for Math and Physics (IMSP), and the Ministry of Secondary Education, researchers are evaluating the impact and cost-effectiveness of temporary supplemental math teachers on girls’ numeracy skills, professional aspirations, and early career labor market outcomes. From a subset of schools that the Ministry of Secondary Education classified as having inadequate math instruction, researchers randomly selected 90 schools to compare how different variations of this intervention affected girls’ math skills. Researchers assigned schools to one of two supplementary teacher program variations or to a comparison group. Supplemental math teachers: IERPE and IMSP trained older male students to serve as supplementary teachers for three-month periods. Supplemental sessions were available to all students (both boys and girls) in an eligible class. Girls-only math and life skills supplement: IERPE and IMSP trained female supplemental teachers, but supplemental sessions were only available to girls and designed to cater to the specific needs and learning levels of female students. The female teachers in this group were also trained to give life skills training to the girls. Comparison group: No supplemental sessions were made available to students. In 2018, researchers plan to conduct an endline survey and gather school administrative data to measure each intervention’s effects on student performance and aspirations. Researchers also plan to compare the cost-effectiveness of the two approaches.